A Passman is a virtual appliance. Users can access it on desktops, tablets or even smartphones through the web. The activity of privileged users can be monitored when Passman is integrated with Balabit SCB (Shell Control Box). This integration ensures that the users – in a session built by SCB – do not know the password since it directly goes from Passman to SCB. Passman takes care of changing passwords automatically when logging users in and out and storing passwords encypted. Beyond this, it contains many functions that ensures audit-readiness. It is possible to see who, when and where sommebody logged in. It also possible to get notifications and alerts when it notices something unusual. It also helps you to get ready for the upcoming regulation of the Europian Union, GDPR (General Data Protection Regulation). AD authentication for users helps you to centralize user management. Thanks to the Network discovery function it is easier to implement the solution reducing the administrative burdens of the operations team. 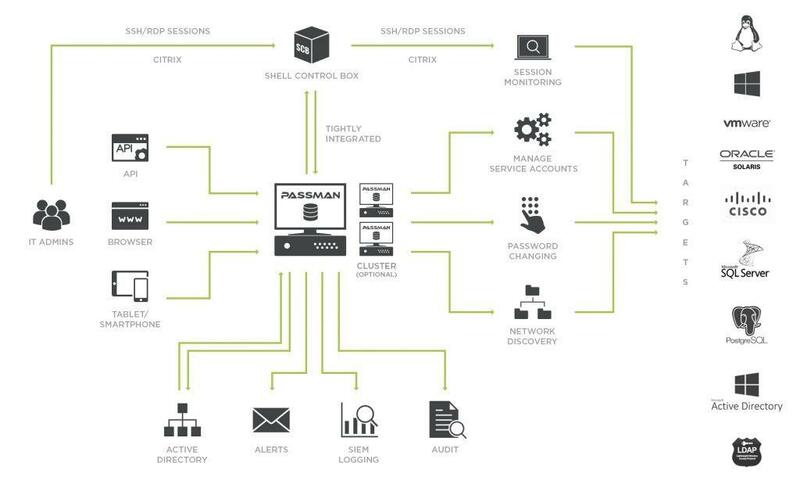 Since Passman is a mission-critical solution, it should operate with high availability. This can be achived if there are more (min. three) Passman appliences are linked in a cluster archtecture. A cluster archtecture can be scaleable or fail-over. I have a question!I’m interested in it!